For most of us, grilling season is upon us and for those of us who are still braving some cooler temps, it won’t be long. Grilling some chicken this weekend, I realized I had never shared my super simple marinade with y’all. This all-purpose marinade is probably one of the first recipes that I developed all by myself. I was probably 7 or 8 when I started mixing various liquids from various jar in the refrigerator to season my favorite grilled meat. 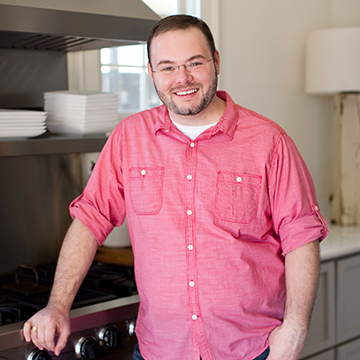 The ingredients changed over the years as I learned more about marinades and the job of the various components in them. This is the final version that I’ve been using for years. It’s great for nearly everything including chicken, pork, beef, veggies, even fish. We love it at our house and I know y’all will too. Combine the ingredients in a jar with a lid and shake well to mix. Marinate for 30 minutes to overnight. Can’t wait to try this! Looks great. Actually you can. It’s called an emulsion. But that’s not what we’re doing here. This sounds perfectly delicious. I can’t wait to get my grill on with this!!! Yummy!! It really is my favorite marinade! I hope you’ll enjoy it! This appeals to me because there are no exotic, unobtainable ingredients and it fits my budget and time schedule. Looking at a high temp of 82 degrees today in Beaufort,SC and the grill is calling. 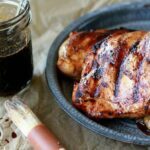 Thanks for a great go to marinade for the spring and summer (and fall and winter)! great recipe! I am definitely going to try this one! 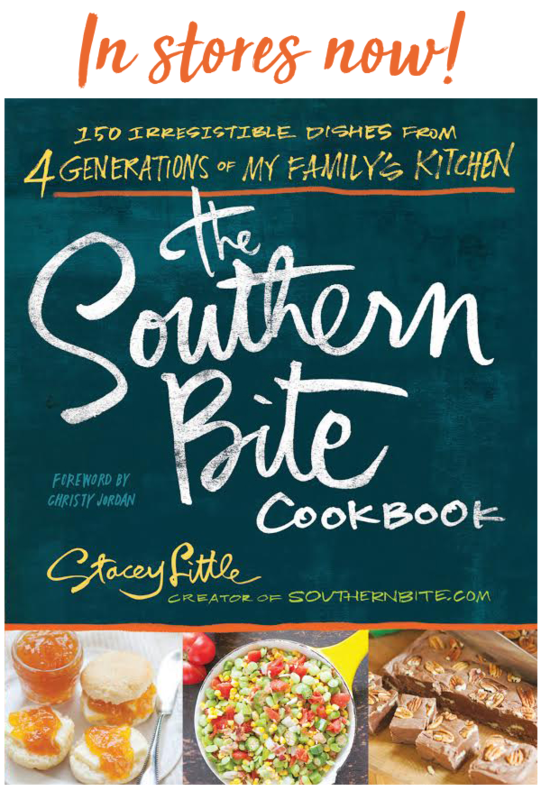 Thanks Stacey for your wonderful recipes! You are so welcome! I hope you’ll enjoy it! If anything is going to marinate for more than 30 minutes, I would recommend refrigerating it. I can’t use regular sugar, do you think I could use splenda? I found this on Pinterest and tried it that night. Only word to describe…DELICIOUS! Was the best grilled chicken I have had in a long time. Thanks for the recipe!! Wonderful, Kelly! So glad you liked it! Do you use all three oils or is it a choice of these three. Sounds great and I want to try it. I bought a big 2 1/2 lb flank steak, pounded it unmercifully to tenderize and stuck a fork in it a few hundred times. Then immersed it in a container with this marinade and put in the refrig for 24 hours. Grilled on a hot grille for 10 minutes on each side, until it was medium rare to medium. Let it set for five minutes and then carved diagonally into thin strips. 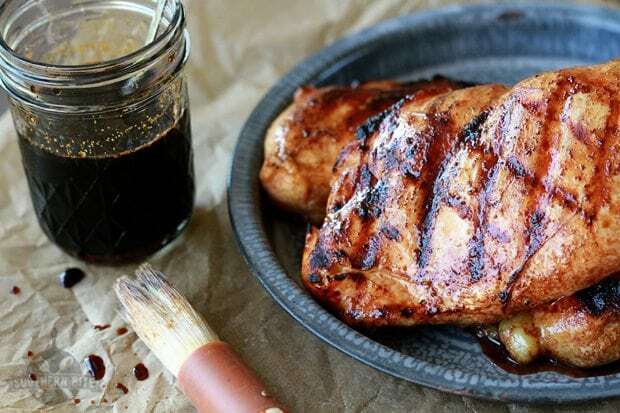 The marinade was perfect, and the meat had a flavor that was absolutely delicious. Served with grilled onions, French bread and a mild horseradish sauce and a cold tossed salad. Our guest are still raving about the dinner. The marinade was the difference that turned a relatively inexpensive piece of beef into a tender, succulent meal. Thanks Stacy. I’m so glad it turned out so well for you, Bill! 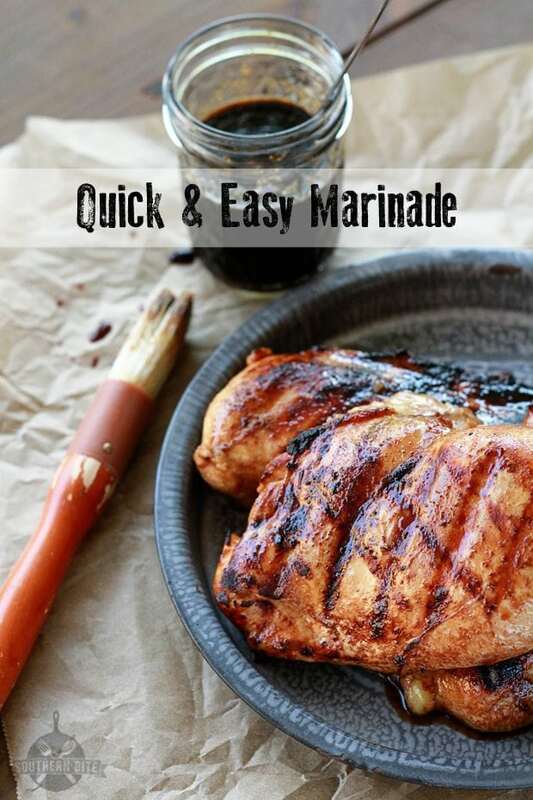 I have been looking for an easy to make marinade and this looks delicious, I can’t wait to try it! Wonderful! So glad it turned out great for you! Will not having Worcestershire be a huge comprise? Any substitution recommendations? if baking in oven how long and and what tenp? It really depends on the size of chicken breasts – about 30 minutes. Can you use this recipe for canning so it doesn’t have to be refrigerated until opened and can be shelf stable for gift giving. If so, are any of the ingredients changed or extra ingredients added for that and how long do I process it for a water bath method? Thank you for sharing, sounds awesome! Hi Lina! I actually don’t know much about canning, so I’m not the best equipped to answer that. This is the only marinade I use for chicken. Everyone loves it! So glad y’all have enjoyed it! It’s definitely my favorite too! Thank you for sharing your recipe. I can not wait to try it. This recipe looks so good and easy to make. I was wondering if the recipe could be doubled or tripled that way I can put it in the fridge for later use? And if so how long do you think you can last in the fridge? Thanks for sharing your recipe. Hi Debi! You can certainly scale this up. I usually keep it in the fridge for a a week or two. hi…i tried your recipe tonight and awesome,we love it so much,its so tasty.i just add more lemon in it,marinated for 30 minutes and boil for about 10-15 minutes to reduces the sauce then i put in oven together wirh the sauce for about 15 minutes both sides…my boss was so very happy.i serve with the spagetti.thank you for the recipe. Got my cookbook this week !!! We marinaded chicken & roasted broccoli both on the grill , absolutely delicious !!! My husband is saying Stacey that your cookbook may kill us !!! This has been a delicious Saturday , thank you so much for these recipes ! Thanks so much for getting my book, Sherry! I hope y’all find lots and lots you enjoy! !